Today my Astronomy Lab was a bit more exciting than usual. Instead of simply learning about the stars and constellations, we finally got to take a closer look. 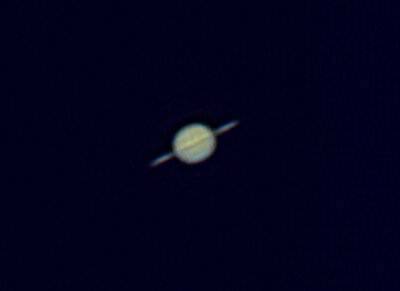 I’ve seen plenty of pictures of Saturn on Space.com, Google Images and in text books, but seeing the real thing is a little exciting! I found an image that someone took of Saturn on March 17th, 2009 and altered the image a bit to reflect the way it appeared when I saw it! Basically identical, just tilted. As you can see in the image, this time of year the rings are edge on and may not even be noticeable to weaker telescopes. The telescopes that the University owns seem to be of decent quality. Now I think I’m going to start looking around for one similar to theirs and start taking some pictures myself of other cool celestial objects. I got to see Saturn when I was in Australia…absolutely amazing! Yeah! I was completely surprised when I finally got it into focus. Crazy! It just looks like another star in the sky until you zoom in on it! I think you’re right about the image being inverted. We discussed that for one type of telescope. It very well could be inverted. Wow, those images of Saturn are amazing! Thanks for the link!